Outlook PST files contain treasure troves of mission-critical data of an organization. This data is used for various key business operations, such as eDiscovery, strategic planning, and implementation of organization's policies. As there is a continuous inflow of email messages, PST file management is a serious challenge. Outlook personal folders (.PST) file get oversized easily and becomes susceptible to corruption when it reaches the maximum file size limit (2 GB for Outlook 2002 and earlier). Storage media corruption may also damage your PST files and if these files are not included in your regular backup and maintenance plan, it may result in permanent loss of data. Other reasons responsible for PST corruption are malware attacks, abnormal termination of Outlook, and hardware failures. If you have backed up important emails to another PST, you can open this PST file in your mailbox to access all the damaged or inaccessible mail items. A folder corresponding to the data file will be displayed in the 'Folder' list. By default, the added folder will carry the name 'Personal Folders'. Outlook Data loss may also occur due to trivial reasons like accidental deletion of emails. This is certainly the most common case of data loss from PST files and in a way, can wreak havoc on your organization. The emails inadvertently deleted from the 'Deleted Items' folder or other mail folders remain in the PST file until they are compacted manually or by Outlook. 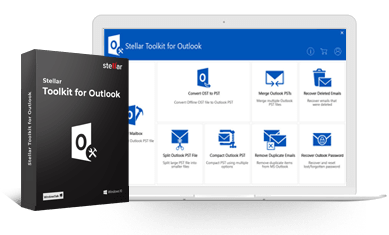 The accidentally deleted items or damaged PST file objects can be recovered using professional Outlook PST recovery software, such as Stellar Repair for Outlook. You should follow the below mentioned procedure to repair your damaged PST file. Launch the Stellar Repair for Outlook Software. The main interface of the software is displayed with the 'Select PST File for Repair' dialog box. In the dialog box, click 'Browse' for selecting the PST file to be repaired. You can choose 'Find' to search for Outlook PST files in your system, if the exact file path is unknown. Click on 'Repair' button to begin scanning the selected PST file. After completion of the scan, all recovered folders are listed in left pane of the main interface. Select a folder from this list and the desired mail item from the top-right pane to preview its contents in the same window. Select the items you need to recover and click 'Save Repaired File' button on the toolbar. Provide a destination path to save the recovered file and click 'OK'. When the process is finished, you will see a dialog box displaying the 'Destination path' and the 'Recovered File Size'. The software facilitates smooth recovery of personal folders (.pst) files created in MS Outlook.